Also, what the hell option did Jorator suggest with his "At first everyone ignored Malia, but the more they ignored her, the worse their affliction got."? He's suggesting all of the "heal our dudes" options. Which includes propitiating Malia, but that's not the only thing he suggested, so that counts for something, right? Oh god, our god-talkers are in on it too. Our entire clan is the chaos. Also, what did we ever do to the Anmangarni? 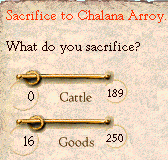 But we're not idiots, and we have our Heroic Magic notwizard, so I sacrifice to Chalana Arroy to end our woes. 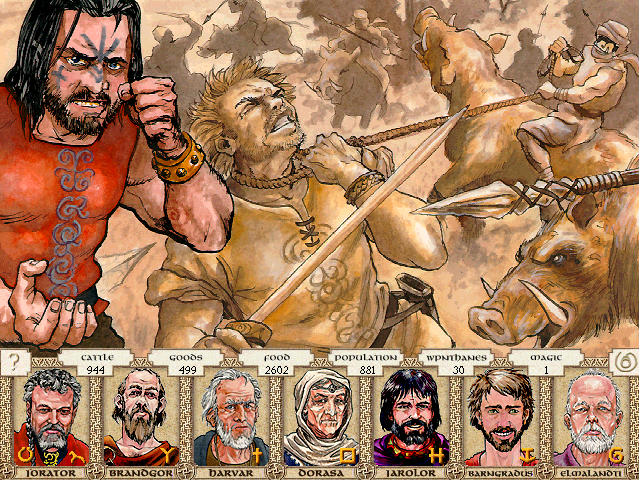 With that settled, I enlarge our shrine to Issaries because money is good. Wilkossi, one of the warriors you sent on your exploratory mission, reports on its unfortunate and premature end. "One of our fellows, Thadart, was taken by the cruel enemies known as the Tusk Riders. We fought valiantly to rescue him from them, but they were fierce, their boarish steeds were fresh, and they knew the terrain better than we. We have heard from our neighbors about the bloodthirsty gods they worship, and know of their murderous habits. Unlucky Thadart is surely dead by now." -Give gifts to Thedart's relatives. -Remind the people that danger is a part of life. -Sacrifice to the gods in Thedart's honor. -"There will be no funeral until Thedart is proven dead." -Send a war party to hunt for Thedart. And to think, we were seeking a bride for Thedart. At least there is no fresh widow to choke on her tears. A poem has more power to stir the heart than an ordinary speech, or even a generous gift. Thedart was very skilled with weapons. Even though he was not a weaponthane, we should honor him as one. King Vingkot disappeared many times, and those of weak confidence thought him slain. But each time he came back, hungry and wanting his dinner, having miraculously escaped death. Although many Tusk Riders live in the Stinking Forest, others roam Dragon Pass, causing trouble. We should sacrifice in Thedart's honor, to speed his spirit to the Halls of the Dead.